Based in San Diego, California, join us for our intensive 6-Week Program specifically created for graduate students, entrepreneurs, business professionals interested in international affairs. The essentials of executive presence and competency. In-depth knowledge of international relations, protocol and diplomatic leadership. Top-notch presentation skills and powerful media image. Cross-cultural fundamentals to influence business decisions and strategic negotiations. 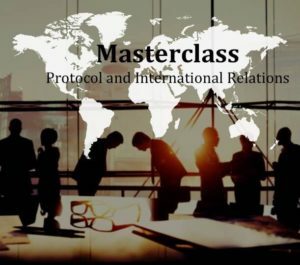 The tools to become the in-house protocol and cross-cultural expert within your company. The credentials to be considered for fast-track promotion in your industry.